Bubba was an expert dribbler and starting teething early on, she had her first tooth by five months! 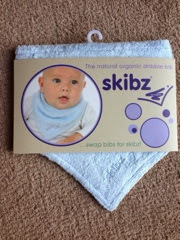 I have every suspicion that my boy will follow suit so was excited to try a Skibz dribble bib. 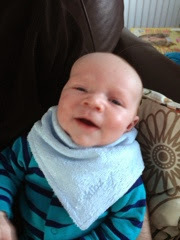 As little man is only five weeks old we don't need a dribble bib in the conventional sense yet but he does have a milk dribble habit. 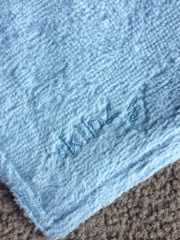 I started keeping a bib on him after his bottle but it was always still wet and smelt of milk and looked a bit rubbish whilst out, so now I change it to a Skibz bib. 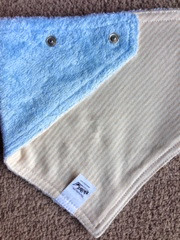 We received a wonderfully soft bib 'Organic baby blue' and as the packaging states, it's ideal for a newborn. I will definitely be buying more bibs as he grows up and as there are so many great designs it's not going to be an easy task. All the designs can be found here.